Accurately create and manage sales and purchase records of multiple Companies at one place. 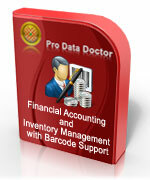 Advanced barcode technology provides quick and accurate accounting process by eliminating manual database entry. Easily maintain all your business transaction records with the help of various vouchers such as quotation, sale, purchase, stock, payment, receipt, journal etc. Generates various business transaction reports to analyze overall business performance in efficient manner. Database connectivity features allow users to fetch and access the data from other system when required. Data backup and restore option facilitates you to save the data back in case of data loss event. Multiple currency support allows you to manage your business accounts in various currency formats as per requirement.